This guide provides basic information about the 2014-15 renovation of the Foothill Library. 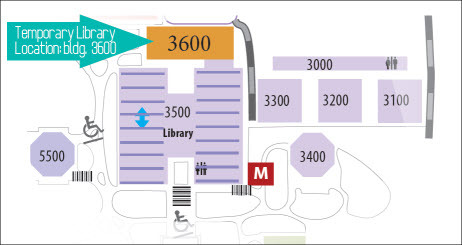 During renovation, the Library will be located in Building 3600 (former Media Center). Fri. 8 a.m. – 4 p.m. Individual and group study areas will be significantly reduced in the temporary facility from 475 seats to 25. Student printing will not be available in the library’s temporary location but in other locations around campus, including the relocated Media Center in Room 5941 in the Temporary Village. The Foothill Library (Building 3500) will close July 7, 2014 for major renovations and will move to the the former Media Center (Bulding 3600) for the 2014-2015 academic year. Better lighting, heating, and air conditioning and a roof that doesn’t leak when it rains! The Foothill College Library and Learning Resources Center occupies a primary place for intellectual discovery, knowledge dissemination, and academic learning. The LLRC through its quality instructional collections, variety of services, and well-trained staff directly supports the College’s mission to provide a superb educational environment for its community of learners. Critical to this vision is a facility capable of providing the learning infrastructure and physical spaces required for higher education in the 21st Century. The LLRC facility must encompass yesterday’s knowledge and today’s information in a building designed around the nexus of knowledge-based collections, access technologies, and services that support learning.